MLG in ATL! We’re diving head first into another Open Bracket as the 2017 Call Of Duty World League continues to pick up steam. Home to both SCUF Gaming & Kontrol Freek, MLG Atlanta is guaranteed to be an amazing weekend for fans & competitors alike. ASTRO will be onsite watching over 170 amateur and pro teams from around the world compete for a $200k prize pool, 100k CWL Pro Points and the title of MLG ATL Champions. From February 10-12th we’ll be powering the audio at MLG Atlanta in the Gamebattles booth, the Open Bracket and Main Stage stations with our MixAmp TR. We’ll also be offering a headset rental program in the Open Bracket section for competitors who forget their headset or want to compete with ASTROs. The rentals are free with a valid ID! All you have to do is visit the ASTRO Check-Out Station in the MLG Open Bracket and we’ll let you borrow an A40 TR Headset for the weekend. Their will be a limited supply of headsets so be sure to hurry over because it’s first come first served. 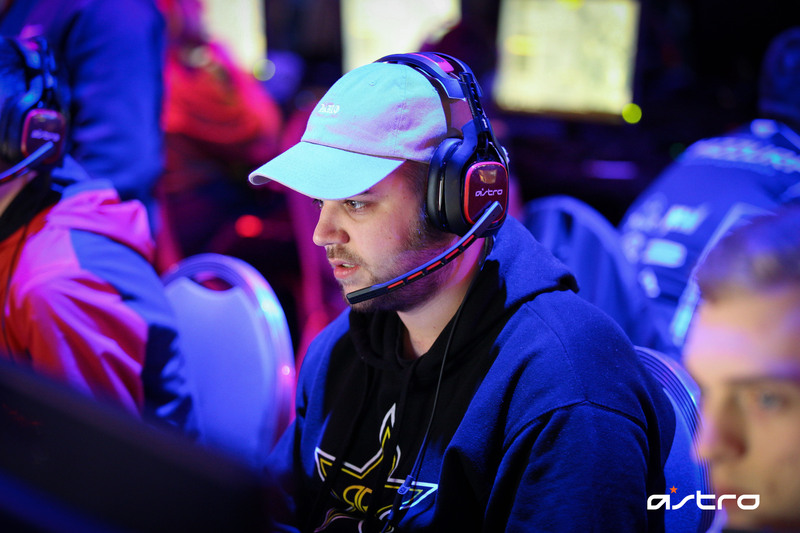 Last December, MLG hosted the first CWL 2017 Open LAN in Las Vegas with some surprising upsets and a changing of the guard. Many young and hungry teams showed up to stake their claim in a new game and show off what they’re made of. Through their dedication to practice & teamwork these rising teams are executing creative strategies that have proven vital in keeping the veteran teams on their toes. Since then, teams have been competing in coordinated online tournaments by MLG and Gamebattles. The Gamebattles 2K tournaments offer up to 2000 CWL Pro Points that teams accumulate over time. These CWL Pro Points provide a global ranking system that measure the performance of all CWL competitors and play a major role in each team’s future tournaments. So far the 2017 Gamebattles 2K events have helped several winning teams secure invitations to MLG Atlanta and improve their seed in the pool play brackets. The reason they’re called “Open Events” is because sign-ups are open to everybody that wants to compete. While most teams sign-up through the Open Bracket, MLG has also invited 16 teams to compete in Atlanta based on the CWL Pro Points they’ve earned since MLG Vegas. These 16 teams have been split into 4 groups with 5 teams each. 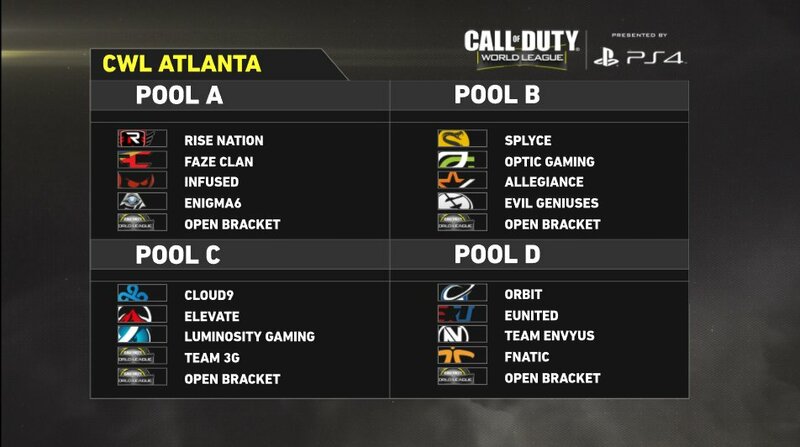 The 5th seed in each group will be filled by the top 4 teams that qualify from the MLG Atlanta Open Bracket on Friday/Saturday. On Sunday, the Open Bracket teams will enter the groups and compete for their share of the prize pool. 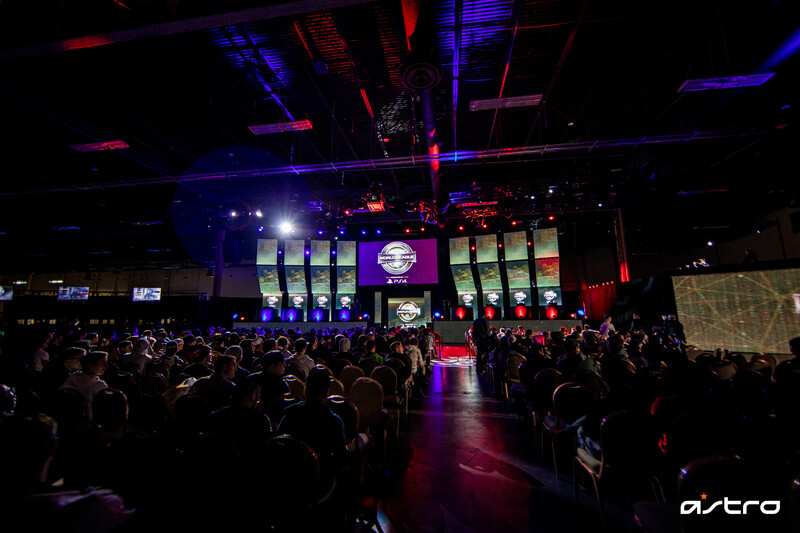 At MLG Vegas, the bulk of the Open Bracket teams were comprised of amateur competitors and intentional pro teams seeking to secure CWL Pro Points when and where they can. In Atlanta we’re expecting to see an event larger turnout from both amateur and international teams because right now every point matters. Gamebattles online offers a maximum of 2000 Pro Points per event while the MLG LAN events boast up to 100,000 Pro Points per event. With the chance to win over 100,000 Pro Points in just 3 short days, serious organizations can not afford to miss MLG Atlanta. After the initial series LAN events and Gamebattles 2Ks are complete, the top 16 teams with the most CWL Pro Points will be invited to compete in Stage 1 of the CWL starting in April. Stage 1 will feature the first Global Pro League on LAN at the MLG Arena. 9 teams from NA, 6 teams from EU and 1 team from APAC will compete in the Global LAN League to become the Stage 1 Champions. The top 8 teams from Stage 1 will advance to Stage 2, while the lower 8 must compete in a relegation tournament against amateur teams. The top 16 teams from Stage 1 Finals/Relegation will earn an invite to Stage 2. 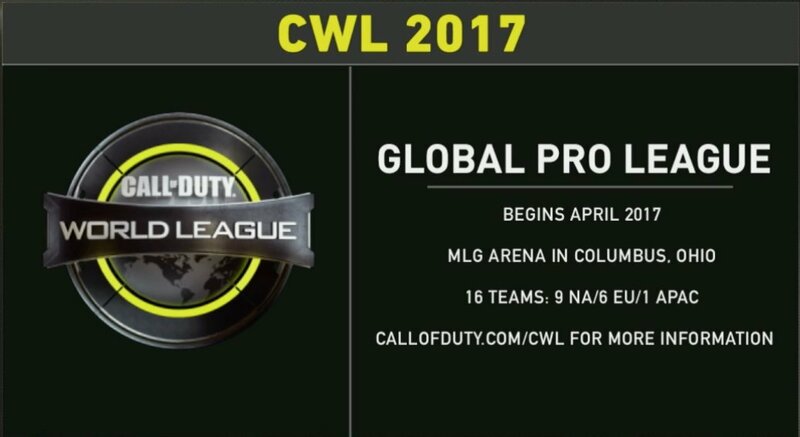 The 16 teams that qualify for Stage 2 will also automatically qualify for the final 2017 CWL Championship. The 2017 CWL Championship will then feature the top 16 teams from Stage 2 competing against 16 new teams that qualify based on their CWL Pro Point standings and LAN Qualifier placements. 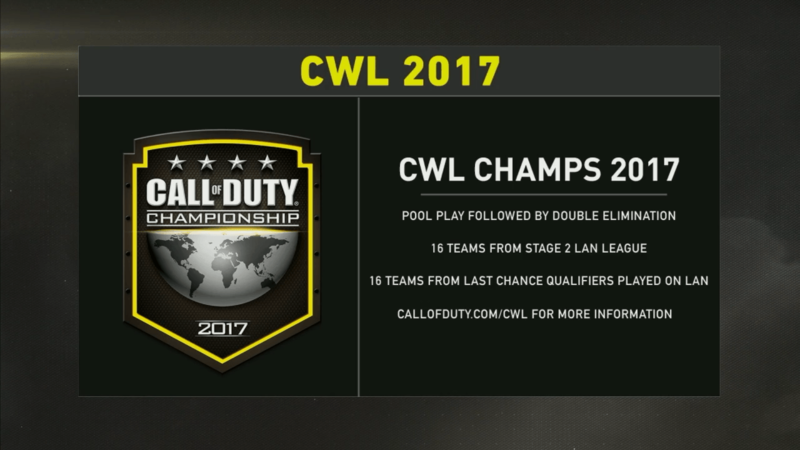 Totaling up to 32 teams competing in the 2017 CWL Championship. – Top 16 teams with CWL Pro Point will be invited to Stage 1. – Top 8 teams after Stage 1 will automatically qualify for Stage 2 and the 2017 CWL Championship. – If your team does not qualify for Stage 1: CWL Pro Points can still earn your team an invitation to the Stage 1 Relegation Tournament. – If your team do not qualify for Stage 1 or Stage 2: CWL Pro Points can still earn your team an invitation to a last chance qualifier and the 2017 CWL Championship. Along with our products & audio tech support, the ASTRO Content & Social Media teams will also be roaming the venue to engage & support the community. There will be a constant flow of content throughout the weekend so be sure to stay tuned to the @ASTROGaming Twitter, Facebook & Instagram for updates, photos, videos & giveaways! Good luck ASTRO Family! We’ll see you in Atlanta!